MaCaHu Press is a chapbook micropress based in Northern California. We had a great time at the Mama Art Cafe on Mission and Leo Street in the Excelsior District. Light, beautiful space with large tables where Stacy gave an awesome reading from his chapbook. More MaCaHu events being planned, even as we speak. Stay tuned! 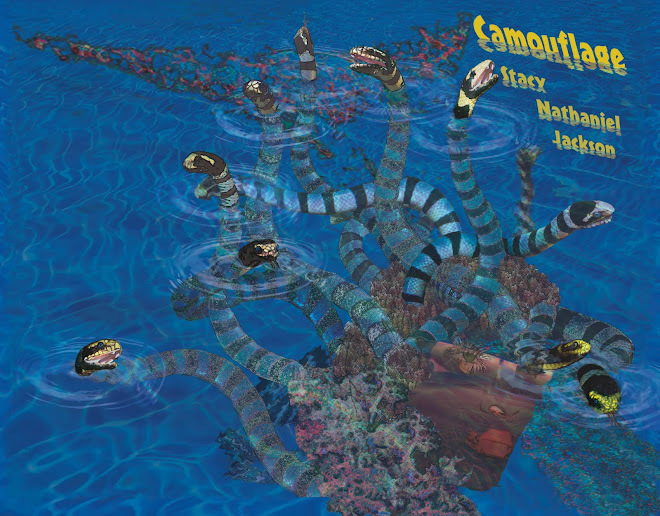 Come help us celebrate the release of our third title, Camouflage by Stacy Nathaniel Jackson. Stacy will read from the book and sign copies on Sunday September 5 at 5pm at Mama Art Cafe. We are coming out with MaCaHu chapbook #3 in the middle of July! Stacy's poems and Mary's visual art combined, a beautiful addition to your bookshelf. News about MaCaHu readings coming soon! Mary did such an amazing job on my book cover. I have had a great time giving readings here and there, selling my chapbook, talking to kindred spirits about poetry. Some of the work in this collection is quite old, and was written when I lived in very remote Alaska from 1996-1999, before I moved to California. My husband Nick worked as a fish culturist for the National Marine Fisheries Service at Alaska's oldest field research station, Little Port Walter. We were on the southern tip of Baranof Island, near a fishing town called Port Alexander. The year-round population at LPW was four humanoids. When my daughter Naomi was born, the population increased to five humanoids. We got our groceries and mail once a week (more seldom in the winter) by float plane. I spent my first winter pregnant, my second with an infant, my third with a toddler. I wrote the poems in order to stay connected to the world around me. And to keep from watching The Shining over & over. Thanks for visiting our blog. We came up with our name based on the first two letters of each of our given names: MAry (Behm-Steinberg), CAroline (Goodwin) and HUgh (Behm-Steinberg). Each year we publish 1-2 titles by a variety of writers (both sung and not-sung-enough) for your reading pleasure. More on each title, forthcoming titles, and how you can purchase one or more of these books soon! Each year we publish 1-2 poetry chapbooks, hand-sewn and beautifully designed. We are: MAry Behm-Steinberg, Designer; CAroline Goodwin, Editor; HUgh Behm-Steinberg, Publisher. At this point we are invitation only, but feel free to query us.